Eric Demetric Dickerson, better known under the nickname Mr. Fourth Quarter, was born on the 2nd September 1960 in Sealy, Texas, USA. He is best known as a now retired professional merican Football player, who played for several NFL teams, including the Los Angeles Rams, Los Angeles Raiders, Atlanta Falcons and Indianapolis Colts. His professional career was active from 1983 to 1993. Have you ever wondered how rich Eric Dickerson is, as of early 2016? It has been estimated from authoritative sources that the overall size of Eric’s net worth is as high as $10 million, which has been accumulated through his successful involvement in the sports industry as a professional NFL player and sports analyst. Additional to this, he has increased his fortune as the co-owner of the sports company Original Mini Jerseys. Another source is coming from his appearance in the TV series “Hawaii Five-0” in 2014. 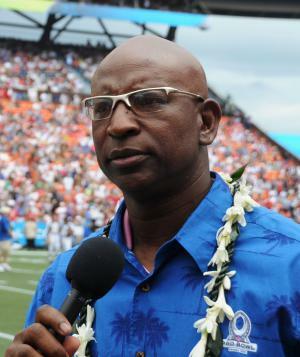 Eric Dickerson was born to Helen and Richard Seal, but as his mother was only 17 years old when he was born, Eric was raised by his great-uncle Kary Dickerson and great-aunt Viola. As a child he was very skinny, but that changed when he started playing football during seventh grade. He began in the position of running back, and continued to play at Sealy High School. During his high school football career, he excelled with 2,642 yards and 38 touchdowns, thanks to which the team participated in the state high school Class AA championship. Eric attended the Southern Methodist University, but before he decided to commit to the SMU, he was also offered scholarships from Texas A&M and the University of Southern California. He started playing for the SMU football team, set several records and received numerous awards and recognitions, including the naming into the College All-American Team in 1982, and a Second Team All-American in 1981. His professional career began in 1983, when he was selected as the 2nd overall pick by the Los Angeles Rams, in the NFL Draft the same year. He stayed with the Rams until 1987, which largely increased his net worth, but what is most important, in his first season, he won the Rookie of the Year Award, and was selected for the Pro-Bowl game. He also set several records, including most rushing yards in season with 2,104, and several others. Because of his great performances, Eric demanded a better contract, however, he was denied several times, and in 1987, he was traded to the Indianapolis Colts, for several draft picks of the first and second round and Owen Gill in exchange. He continued with great performances in the Colts as well, and received a better contract immediately, which earned him $1.4 million per year. Eric stayed with the Colts until the 1991 season, after which he was traded to the Los Angeles Raiders, now Oakland Raiders. He spent only one season with the team, but still increased his net worth. Before he retired, Eric spent a season with the Atlanta Falcons, but playedin only four games because of injuries and his age, since the coach Jerry Glanville wanted to use younger players. To speak of his accomplishments in the NFL, he participated six times in the Pro-Bowl game, he was five times First Team All-Pro, and he was the NFL rushing leader in four seasons. Furthermore, Eric won the NFL Offensive Player of the Year in 1986, and was named as the NFL MVP in 1983. Thanks to his successful career, Eric was inducted into the Pro Football Hall of Fame in 1999, and his jersey number 29 was retired by the Los Angeles Rams. After retirement, Eric briefly worked as a commentator and broadcaster for the KCBS in Los Angeles, which has also increased his net worth. Speaking about his personal life, Eric Dickerson has a daughter with make-up artist Rea Ann Silva. He currently lives in Calabasas, California with wife Peggy Sutton. In free time he enjoys playing golf as well as being active working with many charities, including the American Diabetes Association.